Imagery also indicates that there is continuing and expanding work at the ELWR still under construction. However, it remains unclear when that facility will become operational. Following 38 North’s April 4 report that exhaust plumes were present at the Radiochemical Laboratory’s Thermal Plant in February and March, recent imagery spotted a railroad flatcar at the Radiochemical Laboratory’s receiving building. The flatcar is loaded with what appears to be four rectangular tanks or casks. Such tanks or casks could be used to supply chemicals used in a reprocessing campaign intended to produce additional plutonium, haul out waste products or a number of other related activities. Loaded railcars have only been observed here on a few rare occasions in the early 2000s—all associated with a reprocessing campaign. 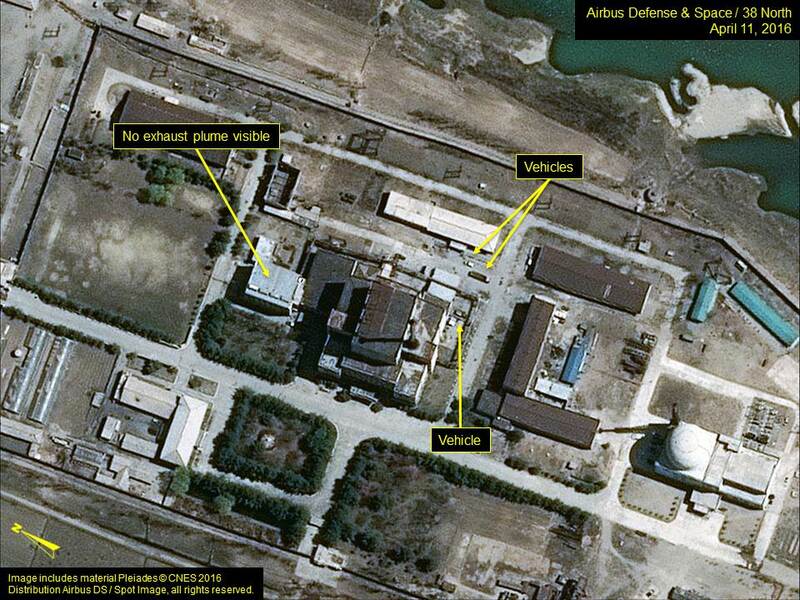 The presence of a loaded flatcar, together with the earlier presence of exhaust plumes, suggests that North Korea is preparing or conducting a reprocessing campaign to separate more plutonium for weapons. Figure 1. Railroad flatcar at Yongbyon’s Radiochemical Laboratory. 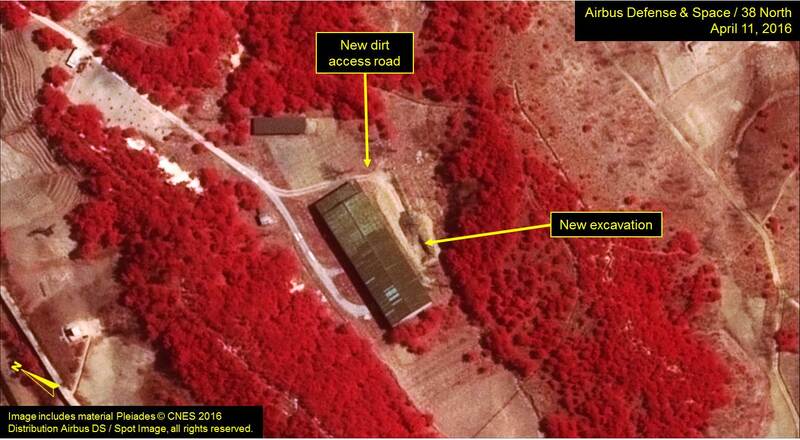 This analysis is reinforced by indications in April 11 imagery that sometime after March 22, North Korea built a new dirt access road and began excavating parallel to and a few meters east of Building 500, located approximately 180 meters east of the Radiochemical Laboratory. The lower level of this structure was used in the past to hold liquid waste from reprocessing in large tanks and solid waste in its main level. It is generally believed that the building has not been used since the early 1990s when North Korea shifted its waste storage to two other areas at Yongbyon. Figure 2. New access road and excavation around Building 500. Image includes material Pleiades © CNES 2016. Distribution Airbus DS / Spot Image, all rights reserved. For media licensing options, please contact [email protected]il.com. While the purpose of the excavation is unclear at this time, and since it is within the security perimeter around the building, possibilities include: 1) expanding the building’s storage capabilities or improving its design features in order to reactivate the facility for a new reprocessing campaign; 2) a reprocessing campaign is already underway and Building 500 has been reactivated for waste storage; or 3) in combination with either of the above, a defect in construction or leak was discovered. False-color infrared imagery, however, does not indicate any damage to surface vegetation; if there is a leak, it would be deeper underground or has not spread out far enough to affect surface vegetation. Figure 3. False-color infrared imagery shows no damage to surface vegetation. 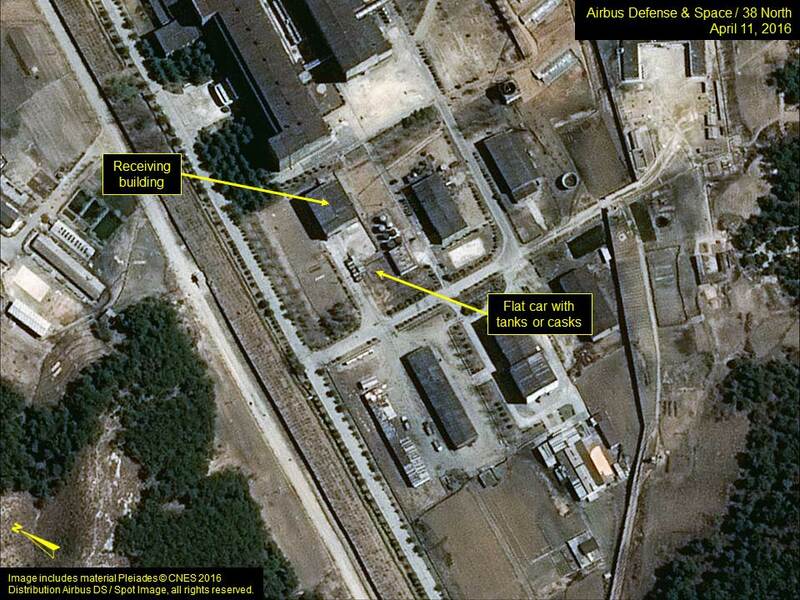 The operational status of the 5 MWe reactor is uncertain. While several vehicles are noted adjacent to the 5 MWe reactor, there are no indications of steam generation or cooling water exhaust. This activity is similar to that noted in 38 North’s April 4 report and suggests that the reactor is not operating or is doing so at an extremely low level. Should this be the case, it would support the above indications of a reprocessing campaign as the 5 MWe reactor would typically have to suspend operations to unload the spent fuel rods to be sent to the Radiochemical Laboratory. Figure 4. Operational status at the 5 MWe Reactor is uncertain. 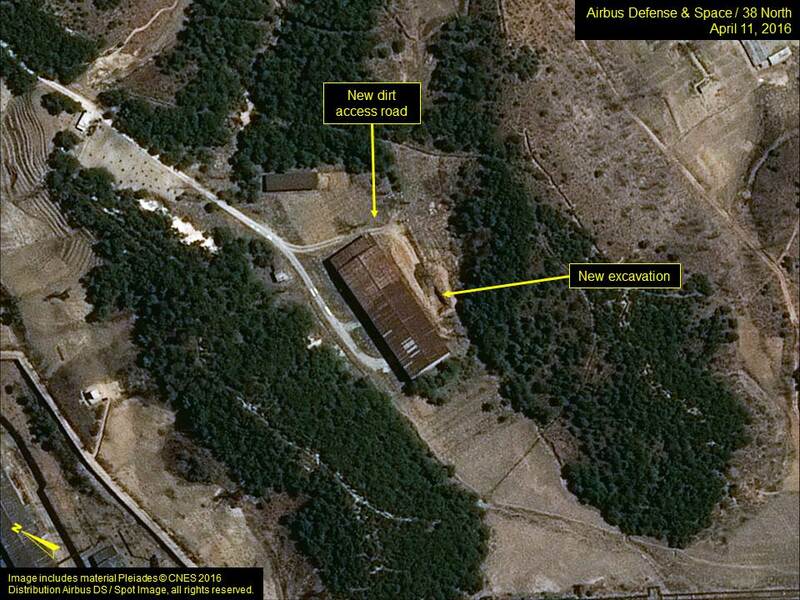 Imagery from April 11 indicates work is continuing and expanding at the ELWR. 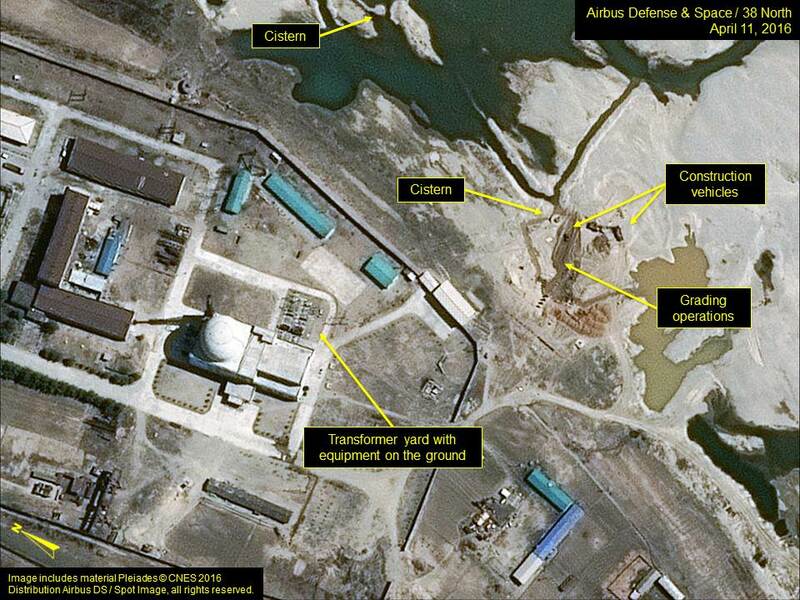 Most notable is the extensive grading around the cistern located approximately 150 meters southwest of the reactor. This cistern is part of the cooling system for the new reactor. Work is also continuing in the transformer yard adjacent to the ELWR and equipment is seen laid out on the ground. Figure 5. Grading around the ELWR’s cistern. It appears that steady progress is continuing towards completion of the ELWR although it is unclear when that facility will become operational. Previous estimates and statements have proven overly optimistic as the North Koreans have likely encountered typical engineering, construction and programmatic challenges. 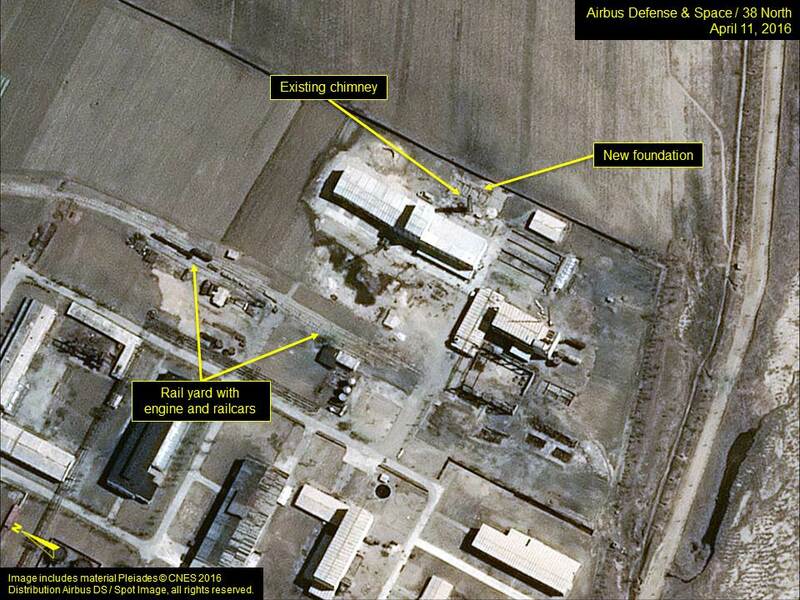 Imagery from April 11 also shows that construction is continuing at a steady pace at a new facility, the purpose of which remains unclear, in the southeastern corner of the uranium enrichment complex. While the two largest buildings appear to be externally complete, construction is continuing on both the east and west sides of the largest building. Notably, on the east side, a new foundation appears to be under construction. The fact that the chimney from the razed thermal plant was not demolished and is adjacent to this new excavation suggests the possibility that the foundation is for a new plant. The rail yard that serves this area remains active with the presence of an engine, several rail cars and material on the ground. Figure 6. Construction continues on new site near the Uranium Enrichment Complex.